Motorcycles in Florida, due to their comparatively smaller size, are often difficult to see, so when a motorist fails to pay attention or violates traffic safety laws, severe and debilitating accidents can occur. Over 100,000 motorcycle drivers and their passengers are injured every year, whether due to negligence or unsafe road conditions; however, victims of personal injury can obtain legal representation to mitigate the state of physical, emotional, and financial hardships caused by the incident. 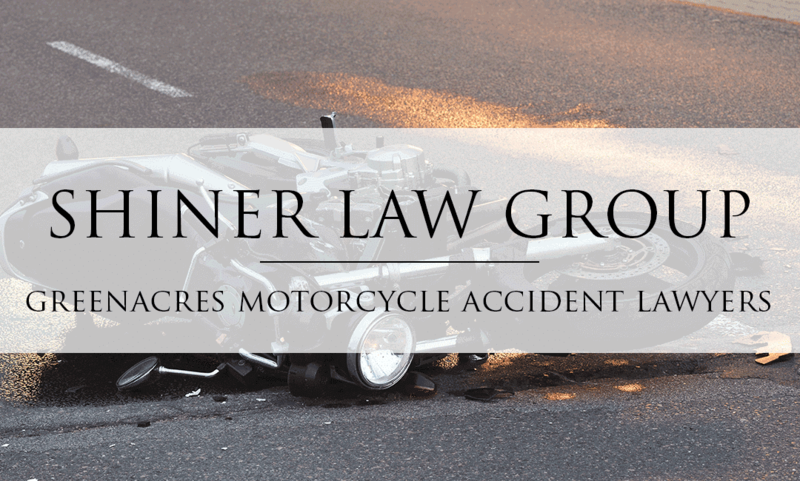 At the Shiner Law Group, our award-winning motorcycle accident attorneys have the in-depth knowledge of Florida’s legal processes to obtain the favorable and substantial results our clients deserve. We provide sound legal solutions and aggressively pursue the best results, so you have the financial relief you need to move beyond your accident. Call us today or visit us online to discuss your legal rights and options in a free consultation. Our law firm can navigate you through the civil litigation process, identify insurance traps and pitfalls, and help you build a compelling personal injury claim. Like most personal injury cases resulting from negligence, the causes of motorcycle accidents are virtually limitless; however, as most collisions are caused by another motorist’s failure to yield the right of way, understanding the factors that contribute to Florida accidents can prevent liability and reduce the risk of personal injury. Traffic safety law violations: Due to a motorcycles comparatively smaller size, Florida drivers often do not see motorcyclists on the road, whether due to inattention or a motorcycle driver slipping into a blind spot. Common scenarios of traffic safety law violations include, but are not limited to, a car turning in front of a motorcycle, performing an unsafe lane change, or running through a red light. Product liability: In rare circumstances, an accident can be caused by no fault of the driver due to a component defect in the vehicle. If product liability contributed to your injuries, an experienced motorcycle accident attorney can help you hold the component’s manufacturer liable. Unsafe road conditions: As motorcycles require a longer stopping distance than standard passenger vehicles, drivers may sustain injuries resulting from unsafe road conditions. Inclement weather, construction, uneven pavement, and water accumulation are common examples that contribute to personal injury. With over 15 years’ experience successfully recovering millions of dollars in settlements and verdicts for victims of personal injury throughout Florida and the United States, the attorneys at the Shiner Law Group have a results-driven approach to recovering a broad range of damages for your injuries. We help victims file their claim within the state’s four-year statute of limitations by gathering key evidence to establish fault and holding the appropriate parties responsible. Our trial lawyers will ensure your legal and financial interests are fought for because we are committed to providing sound legal solutions for victims who suffer from another party’s negligence.